As I prepare for my summer trip to Italy, it is time to get me in the mood for great Italian cuisine. So this classic Italian salad is a colourful combination of tomatoes, black olives, hard-boiled eggs and golden croutons. Why don't you try it. Put eggs into a saucepan of water, bring to the boil and cook for 10 minutes until hard-boiled. Drain, rinse under cold water then leave to cool. Meanwhile, put the cubes of sesame roll into a plastic bag with the olive oil and toss together. 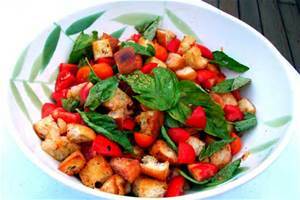 Tip on to a baking sheet and bake these croutons in the oven for 8-10 minutes until crisp and golden. 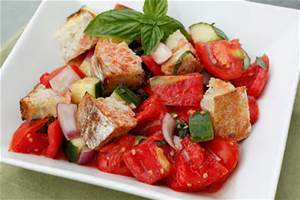 Put the tomatoes, olives and sun-dried tomatoes into a large bowl. Add the balsamic vinegar and basil and salt and pepper, then toss together. Peel the eggs, cut them into wedges and add to the salad with the warm croutons.